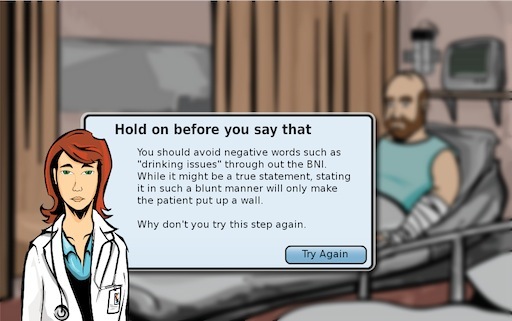 This work focuses on creating a practice environment for medical residents to learn how to properly apply proper BNI (Brief negotiated Interview) techniques for interventions in emergency rooms when patients report substance abuse problems. The application, currently being built in Adobe Flex, will contain a pedagogical agent (or virtual coach) that will help guide the student’s experience, provide guidance where needed, and select appropriate levels of content for individual students. This work is unique in that it combines problems in the typical intelligent tutoring systems domain with issues in narrative-based education and health communication.